For those who are trying to avoid Karo (HFCS), here is a great and tasty alternative for your traditional pecan pie. All of my family tried this, and even my dad said it tasted good and not “different” at all. This is a pretty big deal, as my dad thinks most of my stuff tastes too “healthy” lol. Give this recipe a try, you won’t be disappointed! 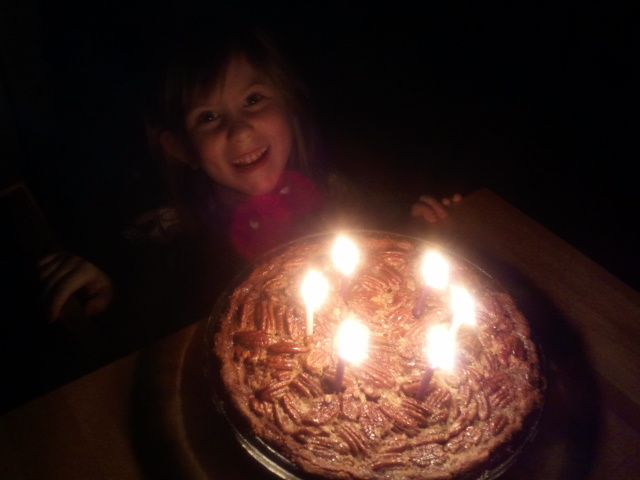 My daughter Jasmine was quite pleased with this pie at her 6th birthday! Whisk together honey, butter, salt and eggs. Add chopped pecans and pour into unbaked pie shell. Bake at 325 for 40-45 minutes or until filling is set. Cover crust with foil or pie crust shields after 15 minutes. Let cool and serve plain or with whipped cream. 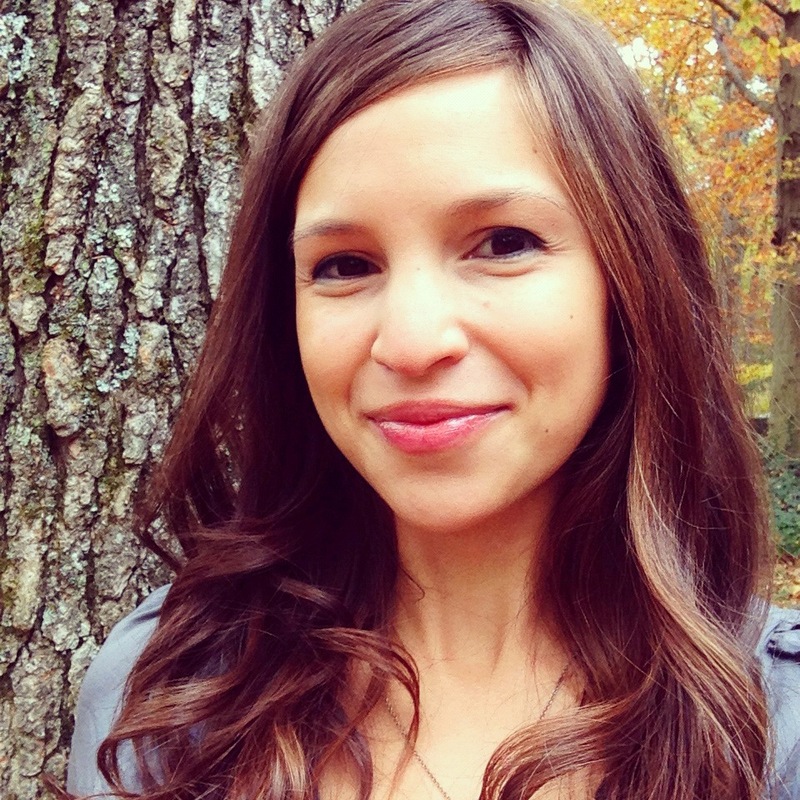 This entry was posted in Gluten Free and tagged gluten free, scd, sugar free. Bookmark the permalink. Thanks so much for your site. Would it be possible to substitute agave syrup for some of the honey? Absolutely. It should work the same used in equal parts. Hi Michelle! I’m so excited to try some of your recipes. I’m not gluten-intolerant but I AM allergic to all things cow AND I eat clean as much as possible. 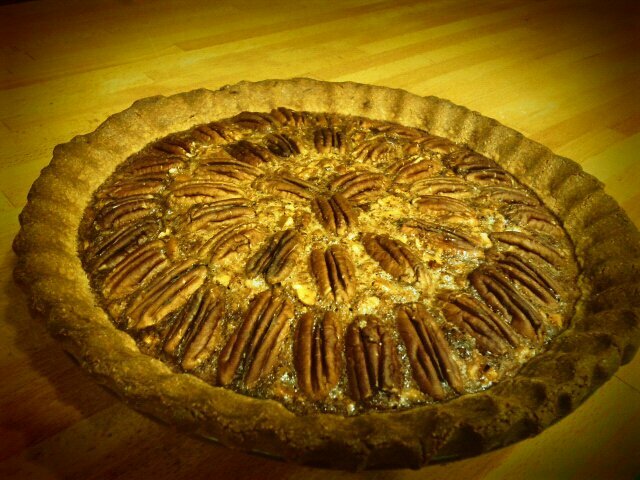 In the honey pecan pie (and mind you, pecan pie is a coveted family fave at my house, not to be “tampered with” under threat of eviction from southern culture), what is a suitable, clean alternative to the butter ingredient? (Before I began eating clean I just used margarine.) In the cookie pie crust, you sub’d coconut oil…would that work here with this mixture or no? THANKS! !